Layered Acorn Oak is an imposing medium-sized to large evergreen tree growing up to 40 m tall with a trunk up to 1.5 m diameter. The leaves are spirally arranged, ovate-elliptic, 16-45 cm long and 6-15 cm broad, with a sharply saw-toothed margin. The flowers are catkins. 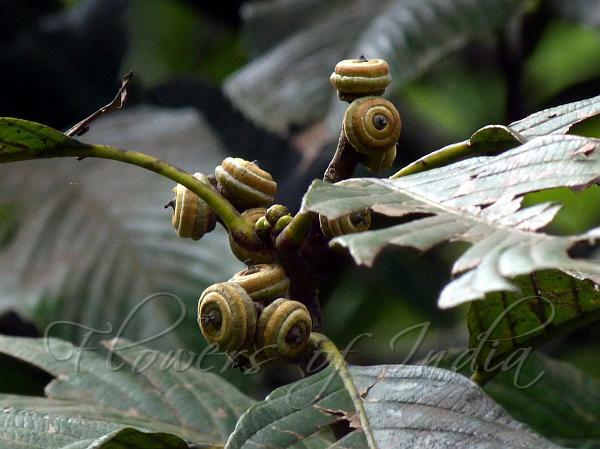 The female flowers mature into large, broad acorns 2-3 cm long and 3-4 cm broad, set in a deep cup with concentric rings of woody scales. An acorn looks like a layered structure of many disks, hence its name, Wood is very hard and durable, and is used for building. Makes excellent fuel. Leaves are used for fodder. Layered Acorn Oak is found in Eastern Himalayas, from C Nepal to Sikkim, Bhutan and SW China, at altitudes of 1600-2800 m. Flowering: April-May.